It is proposed that the works will be carried out between 8am and 4pm commencing on the 30th July. The works should take no longer than four working days depending on weather conditions. All the excavations will be reinstated in full following completion. No footpath closures will be in place during this time. The excavations will be carried out by hand and therefore no heavy machinery will be in operation during the work. Should inconsistencies in the wall foundations be found additional trial pits of a similar nature will be carried out along the wall within the time frame provided above. 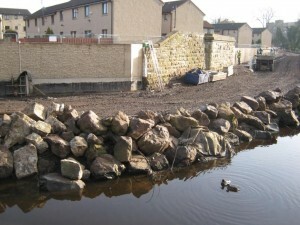 Works will be carried out in such a way that they will not interrupt normal usage of the park. Please let me know if you have any questions or comments regarding the works that have been described above or if the dates proposed are not suitable. Following a FoRP AGM enquiry, the City Council have said that the clumping of grass-cuttings has been made worse by the rain and that grass cuttings are not lifted in any park in the city. The FoRP constitution can be downloaded from the Management Info page of this website. 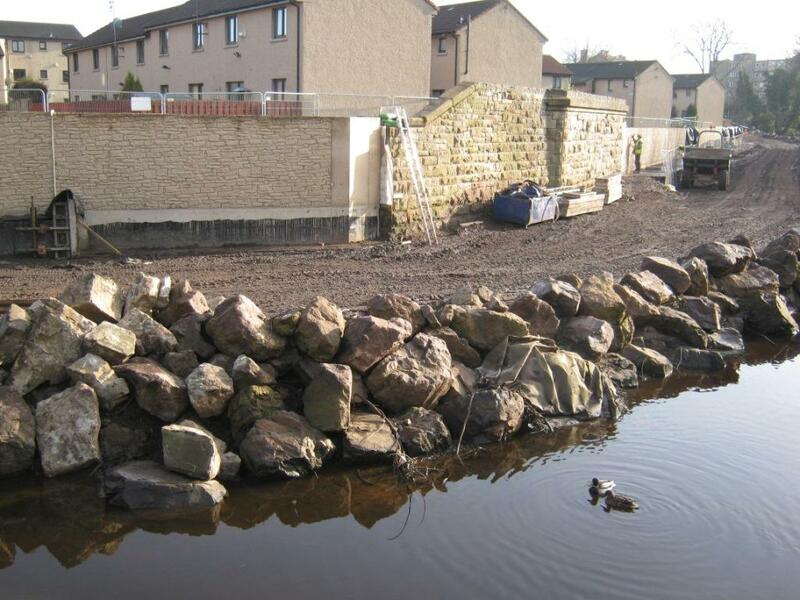 Photograph showing how Council official suggest flood wall against the Murrayfield Stadium park boundary will be faced, following FoRP questioning about this. Apparently the wall on the left is how it will look facing into the park from the stadium, and the wall on the right is how it will look in Riversdale Crescent.